We were on an exceptional cruise. 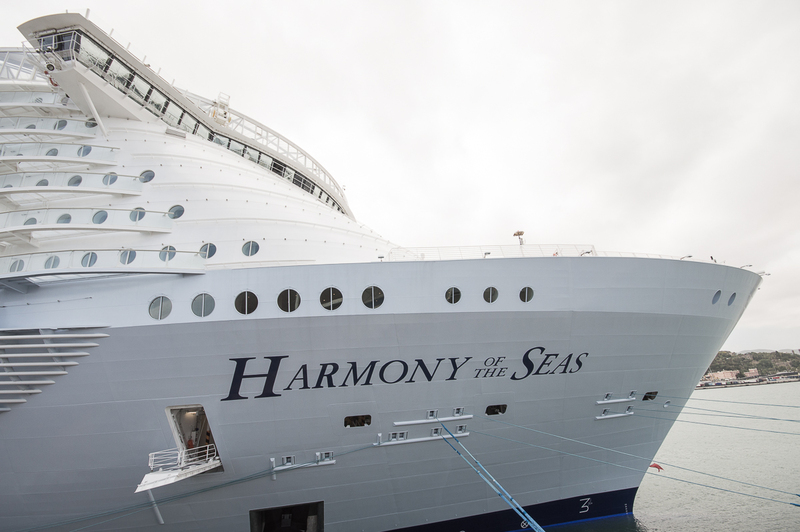 We discovered the new cruise ship Harmony of the Seas for four days. It is the biggest cruise ship in the world. Of course, we did not manage to try everything in this short time, but we did get a good impression of this cruise ship and we want to share our impressions with you. 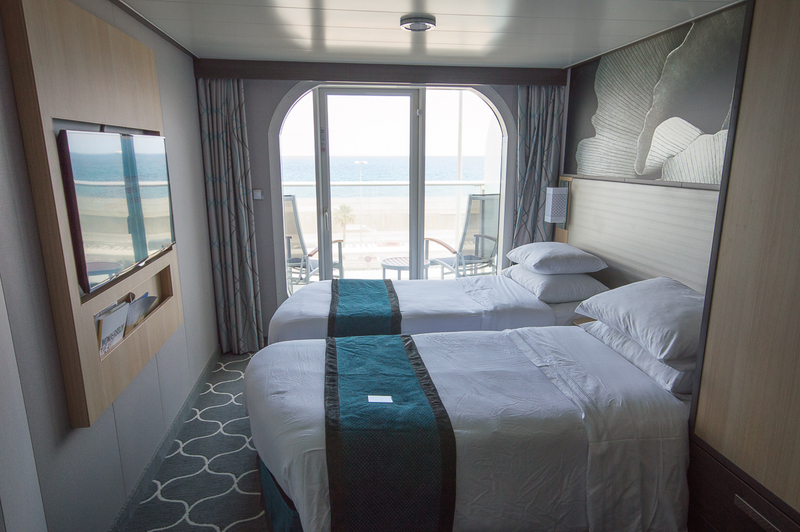 Read in the first part of our cruise review about what’s to see and to experience aboard the Harmony of the Seas. 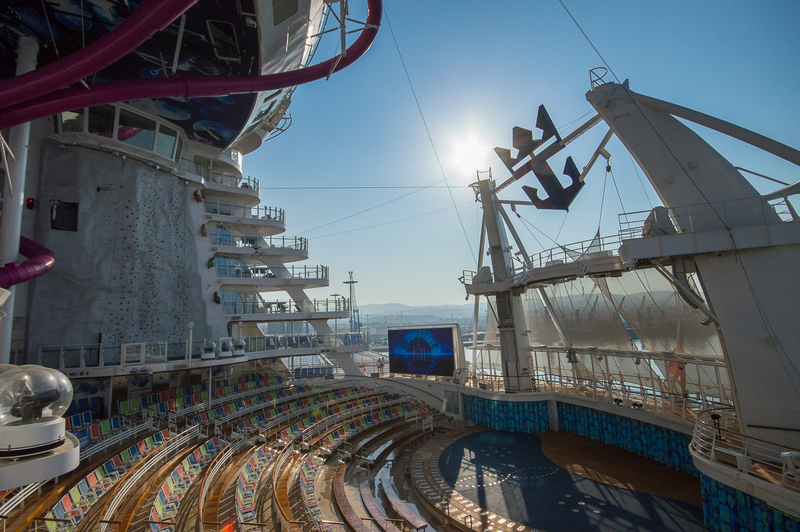 Why is the Harmony of the Seas a ship of superlatives? The Harmony of the Seas travels since her maiden voyage on the 29th of May in the western Mediterranean. With its 361 meters in length, the Harmony of the Seas is longer than the Eiffel Tower in Paris is high and this cruise ship is twice as big as the Washington Monument. 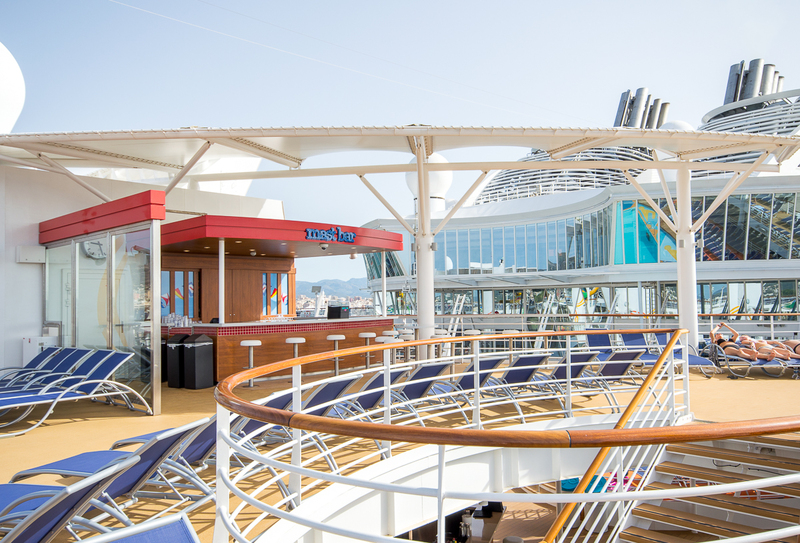 The ship has 17 decks and fits at double occupancy over 6000 passengers. During our flight to Barcelona we could see the cruise ship from the airplane and we realized how gigantic the Harmony is compared to other cruise ships in the port of Barcelona. From the airplane we already recognized the Ultimate Abyss slide, which is currently the largest slide at sea. The two pink chutes have a 28 meters serpentine slide and are located at the rear of the Harmony. There are many other things, which make the Harmony special. For example, the countless works of art on board. On the Harmony there are more works of art than the Louvre in Paris has paintings. In addition, the Central Park has about 12,000 plants on board. All these things make the Harmony unique from our perspective. 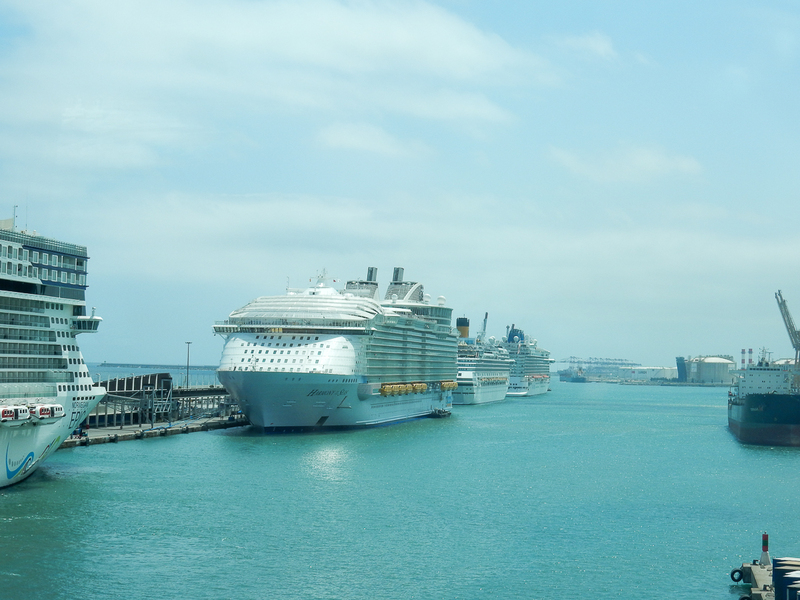 Excited and curious, we embarked the cruise ship in Barcelona. There are several shows on board – including the own musical Columbus, an ice show, a water show and for the first time at sea, the Broadway musical Grease! A real technical experience is the Bionic bar on the Royal Promenade, the robots swirl around and mix cocktails. You can also create an own drink. Voom is the fastest Internet at sea. 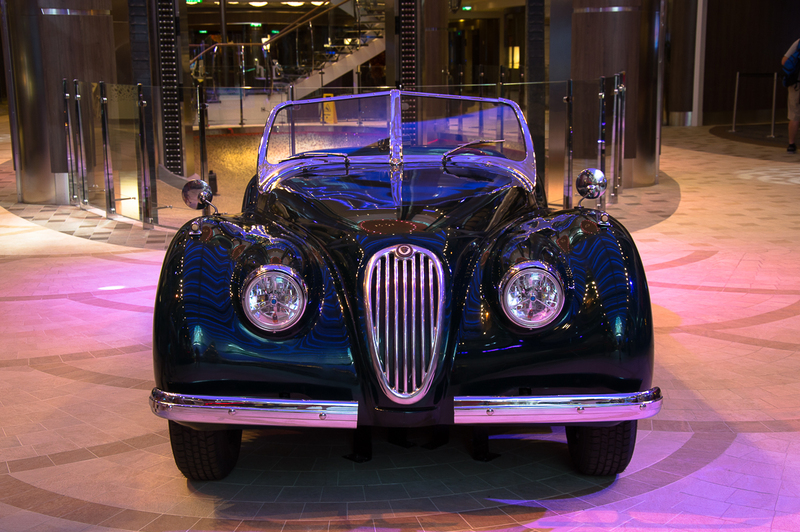 There are 8 specialty restaurants on board, including Jamie’s Italian with Italian cuisine characterized by Jamie Oliver and the Wonderland Imaginative Cuisine, which will charm guests with magical creations. We tried many activities and discovered a lot on board, but first we explored our cabin. Our cabin was on deck 6 (booth 6676) and therefore on the same deck as the Boardwalk with the carousel, the Starbucks and the access to the Aqua Theater. 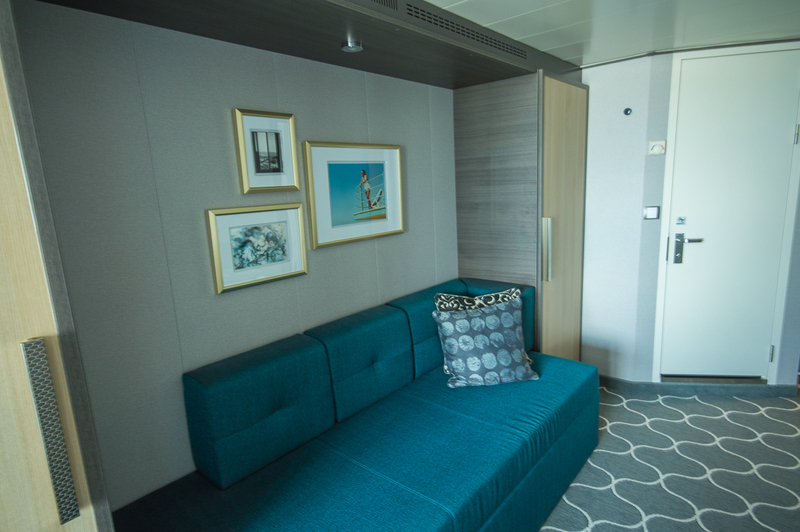 The cabin was located in the middle of the ship and was designed in beautiful shades of blue. 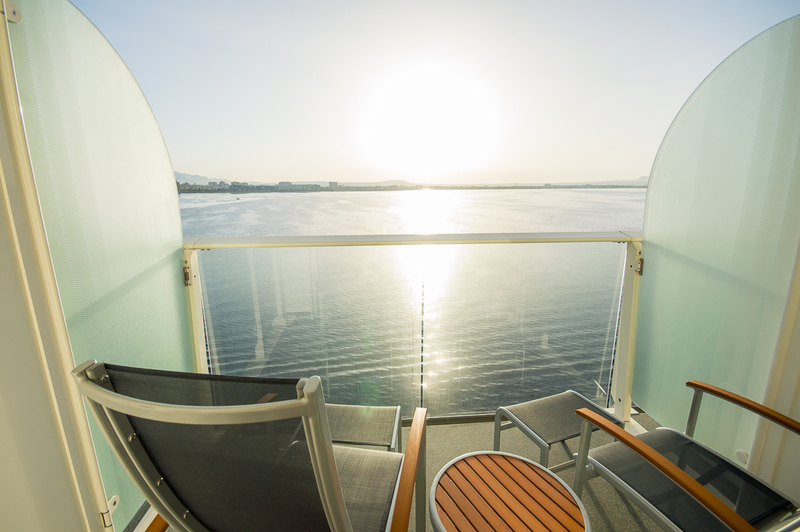 It had a spacious balcony with ocean view and two adjustable chairs including footstools and a small table. In the front area of the cabin were a bed, two wardrobes, a dresser and a desk. So there was enough space for our clothes and cosmetics. The beds were comfortable and the TV was opposite the bed. There are several outlets on the desk. Among others, 2 USB ports and a European outlet. Unfortunately, there is no outlet next to the bed. 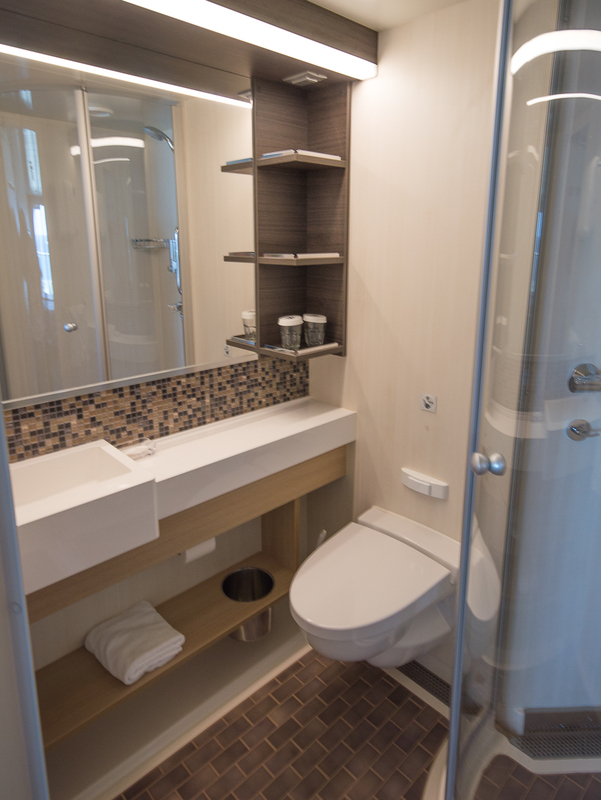 The bathroom was a normal size for a cruise ship and had a really nice and large shower. In the bathroom there were no drawers, but only a little shelf on the side next to the sink. The only real drawback in our view was the tiny sink. 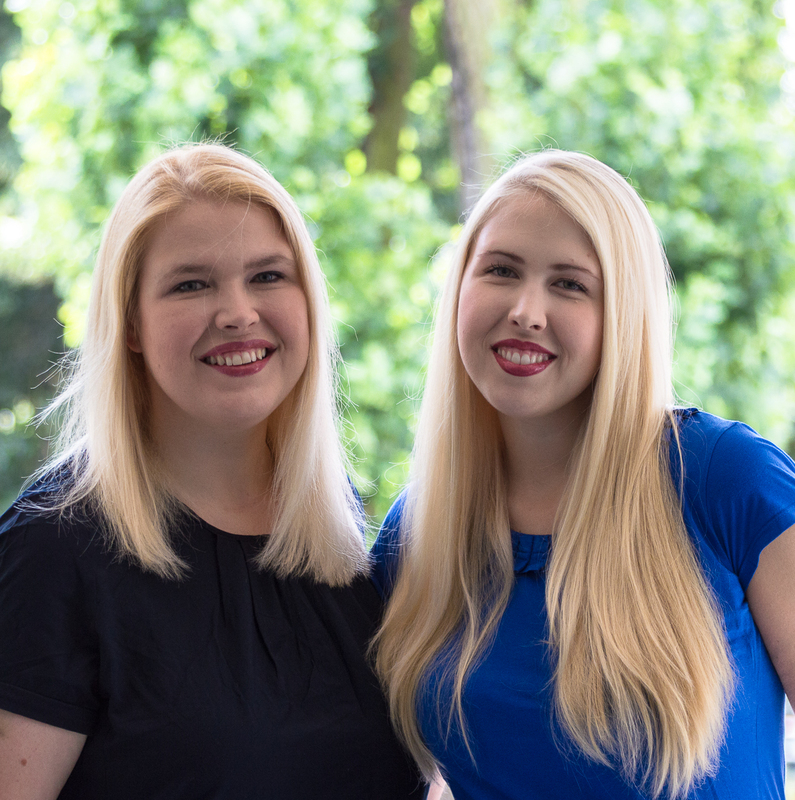 Here we could not wash our face without drowning half the bathroom in water and washing our hair in the sink was not possible. Unfortunately, there are no facial tissues or sanitary bags in the bathroom. Facial tissues can only be found in a cardboard box in one of the dresser drawers. We really liked the balcony. Here we also had breakfast in the morning and tested the free cabin service. The table had enough space for two glasses of juice, two coffees and two plates. 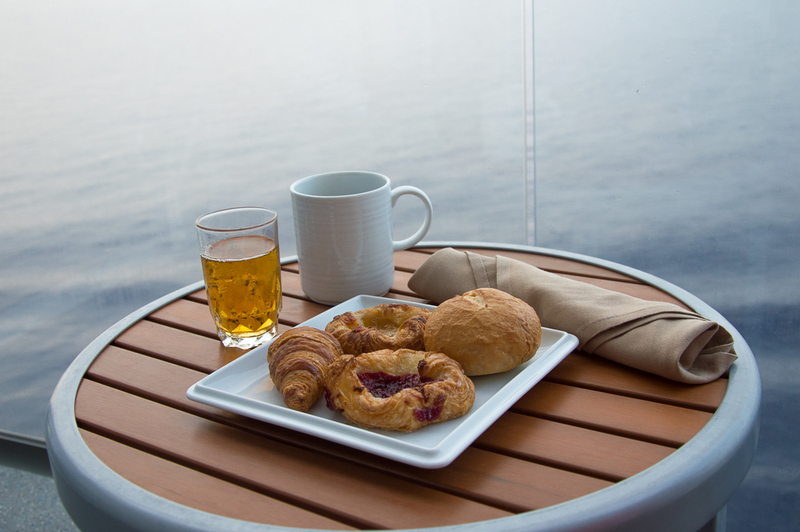 We enjoyed a small breakfast twice on our balcony and loved to relax and watch the ocean. After we explored our cabin, we first strengthened us with a coffee at Starbucks. The prices of Starbucks were similar to the prices on land. Starbucks is extra charged on the Harmony and the coffees that we bought were not included in any beverage package. So you always have to pay extra. 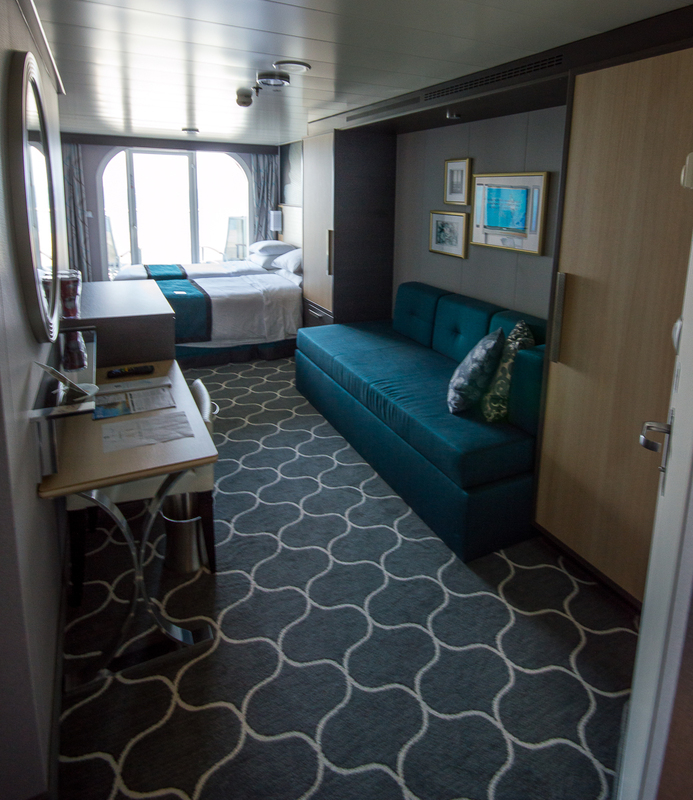 You will find out more about beverage packages and restaurants in our review and blog post on food and drinks aboard the Harmony. Then we had to go to the muster drill. Our muster station was on deck 5, the promenade deck, next to the Bionic bar. It was easy to remember and to find. We did not need our lifejackets for the muster drill. The procedure was similar to on board the Mein Schiff 4. The crew showed us a video, which showed us all safety instructions. This video was only in English. The video was available in other languages such as German, Spanish and Italian on your own cabin TV. Unfortunately, there were no seats at our muster station E1, so we had to stand all the time while watching the video. In addition, we saw the “Wash your hands” movie and song for the first time. It is an animated video that you will see everywhere on board. It remembers you to wash your hands regularly and especially before eating. After the muster drill at the Harmony, we took the lift to enjoy a drink on deck 16 at the Mast bar while leaving Barcelona. The Mast bar is located in the middle of the ship on the outside deck and had a great view of the pool deck and the ocean. Unfortunately, there were only few seats (bar stool) and tables, but the view was fantastic. 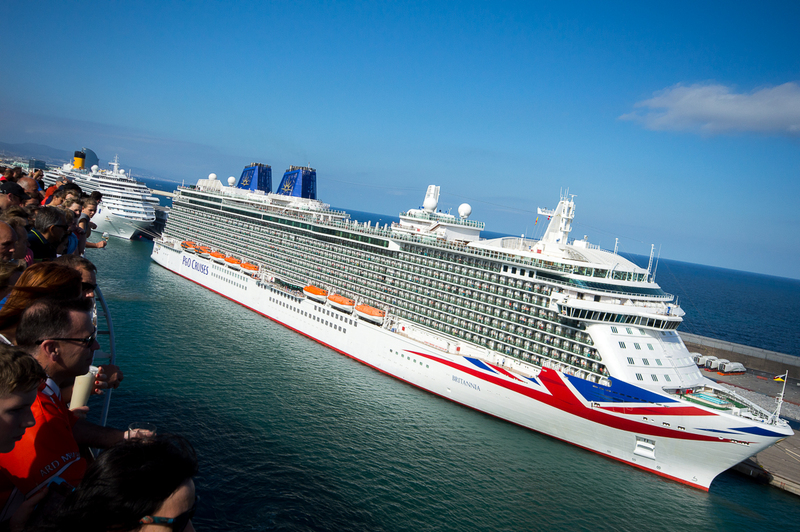 In the port of Barcelona we also saw the Britannia and the Costa Fascinosa. It was amazing to see other cruise ships from aboard such a big ship like the Harmony of the Seas. After that we strolled over the pool deck and then enjoyed a drink in the Bionic Bar on deck 5. From there we went to the main restaurant on deck 4. You can read more about our cruise in the next part of our review. Thank you very much RCL Cruises Ltd. for this amazing cruise with the Harmony of the Seas.